His Majesty King Abdullah II accompanied by Queen Rania Al Abdullah left for Turkey on Saturday, to hold talks with Turkish President Recep Tayyip Erdogan. His Royal Highness Crown Prince Hussein bin Abdullah II was sworn in as a deputy to the King. His Majesty King Abdullah II and Turkish President Recep Tayyip Erdogan agreed during their talks in Istanbul to expand cooperation between the two countries, especially in the fields of economy and investment. His Majesty's talks with the Turkish President, which were held at the Huber Palace, focused on the strong relations between Jordan and Turkey and means to enhance and develop these relations in various fields. The talks were also attended by a number of senior officials from both countries, and the importance of maintaining coordination and consultation between Jordan and Turkey was stressed especially regarding issues of mutual concern and the developments in the Middle East. On the Palestinian issue, King Abdullah stressed the need to intensify efforts to end the Palestinian-Israeli conflict based on the two-state solution, leading to the establishment of an independent Palestinian state with East Jerusalem as its capital. During the talks, the importance of continuing efforts to support the United Nations Relief and Works Agency for Palestine Refugees (UNRWA) was stressed to enable them to continue to provide relief, education and health services to refugees. The talks also dealt with developments related to the Syrian crisis. His Majesty stressed the importance of reaching a political solution to the crisis which preserves Syria's territorial integrity and ensures the safe return of refugees to their homeland. Regional and international efforts in the war against terrorism were reviewed as part of a comprehensive strategy. The talks were attended by the Minister of Foreign Affairs and Expatriate Affairs, the Advisor to His Majesty the King, the Director of His Majesty's Office, and the Jordanian Ambassador to Turkey. And the Turkish side, the Minister of Foreign Affairs, the Minister of Trade and the Turkish Ambassador in Amman. Later, the Turkish President and the first lady held a dinner in honor of His Majesty the King and her Majesty Queen Rania, and the accompanying delegation. 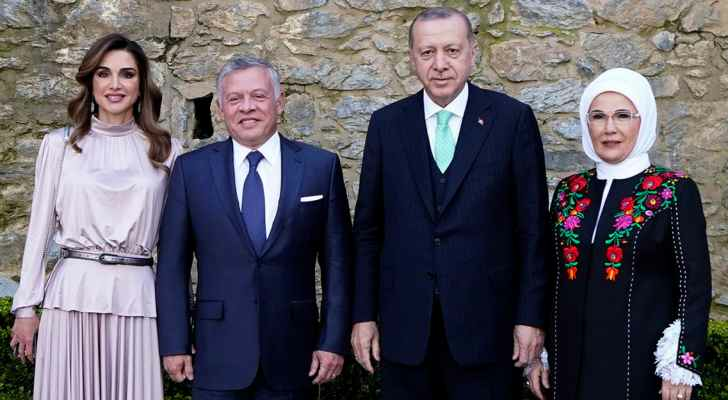 The First Lady of Turkey, Emine Erdogan, expressed her thanks to His Majesty King Abdullah II and Queen Rania on their visit to Turkey by tweeting: "We had a beautiful Istanbul evening with Jordan's King Abdullah II and his wife Queen Rania Al Abdullah. I thank their Majesties for their generous visit."